Kippins Muslin Wrap - Coco (Organic, 120x12..
Kippins Muslin Wrap - Dash (Organic, 120x12..
Kippins Muslin Wrap - Kitty (Organic, 120x1..
Kippins Muslin Wrap - Splits (Organic, 120x..
Kippins Muslin Wrap - Banjo (Organic, 120x1..
Kippins Muslin Wrap - Luna (Organic, 120x12..
Kippins Muslin Wrap - Wolfie (Organic, 120x..
Kippins Cuddle Blanket - Billie (Organic, 2..
Kippins Cuddle Blanket - Splits (Organic, 2..
Kippins Cuddle Blanket - Banjo (Organic, 29..
Kippins Cuddle Blanket - Luna (Organic, 29x.. When the day ends and the stars wake, Luna the mouse twitches her nose to switch on the light in the Kippi moon (it’s a wonderful house for a mouse). 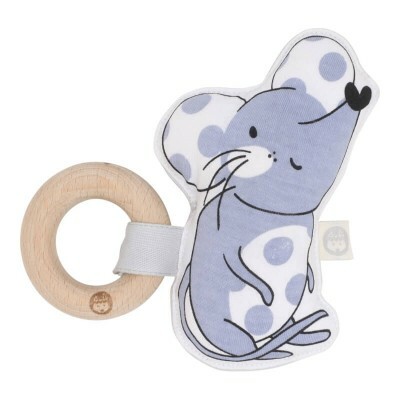 Kippins’ Kiplet™ rattles are very Kippiny - perfect for little movers and shakers who love their Kippins! They’re gentle on new skin and planet friendly. Violet blue and white mouse rattle with grey reverse. Care Instructions: Cold hand wash with mild detergent. Do not bleach. Do not rub, soak or wring. Do not tumble dry. Dry naturally in shade. To clean your beech wood ring, remove it from the rattle clip and wash with a soft cloth in warm water with eco-friendly soap.